Four years ago, Steve and I joined various members of my Dad’s side of the family in Nag’s Head, North Carolina. The Outer Banks! Here are some photos from the trip. This was my very first family reunion, though it seemed odd that it was a “reunion” because there I met several of these people for the very first time. We have family all over the place! The trip was in April, which had the advantage of allowing for cheaper lodging rates, but the slight disadvantage of offering only chilly, blustery days at the beach. I say “slight” because most of my beach memories are from Washington and Oregon beaches, which are almost always like that. It may preclude bare feet and a suntan, but the nostalgia factor for me with cold beaches is real. However, I’ve been living in Minnesota for more than half my life now, and by April each year I am really, really desirous of warm weather. Alas, we had to settle for cold beach walks/runs, while still enjoying great company, some hot tub soaks, a few very engaging activities (Wright Brothers National Memorial is there, and there is fishing too), a wonderful visit with our friends in DC, and a goodly amount of excellent food, prepared both in the rental, as well as from nearby restaurants. The best hummus I’ve ever had was there in Nag’s Head, at the Black Pelican Oceanfront Café. April is a pretty sleepy season in the Outer Banks, so we had the place to ourselves, and I think we visited on our next-to-last day, when we needed a short respite from the huge rental home and the volumes of younger relatives flitting about, therein. We’d read something good about this café, perhaps in Yelp. We’d had our fill of seafood, and just wanted a somewhat healthy but tasty snack. The hummus that arrived at our table was amazingly creamy, slightly warm and had some terrific olive oil drizzled on tap. 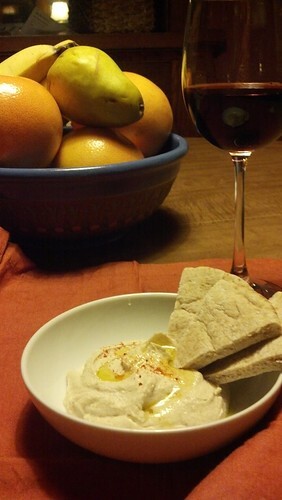 It was perfection for me, though Steve is more in the paste-texture hummus camp. I’ve made several attempts at hummus of any texture at home, and haven’t ever been pleased with the results. The closest to enjoyable my attempts got was a batch that had several cloves of strong, fresh garlic in it – but that was mainly notable in that I suddenly realized the beauty and sparkle of fresh, not roasted, garlic. Just last week I stumbled upon a great article on Smitten Kitchen, cited below. Deb’s advice to remove the chickpea shells seemed very promising, so I decided to give it a try. I’d already printed the article out before I realized that I already own the cookbook containing the base recipe for her adaptation, Jerusalem (also cited below). We got this beauty for Christmas from Mom and I love it! The dishes we’ve already tried from it are flavorful, adventuresome and delicious; the photography breathtaking. So, I headed home with plans to try out the original recipe. And, of course, I adapted it as well, due to the volume (and lack thereof) of certain kinds of legumes in our kitchen and the lack of de-skinning details in the book. What I made, follows. Enjoy! Adapted from Jerusalem: A Cookbook and Smitten Kitchen. Put the chickpeas and navy beans in a large bowl and cover them with cold water at least twice their volume. Leave to soak overnight/for at least 10 hours. Note: the next step may go faster for you if you have the chickpeas and navy beans in separate bowls. The next day, drain all the beans. Remove the skins from the chickpeas by squeezing them (yes, one by one. Herein lies one advantage of using just 3/4 cup chickpeas for this recipe). Most of the chickpeas split in two when I did this, some halves shot across the kitchen, and the skin sometimes took a little effort to remove. Good music and a willingness to go find and rinse errant peas is useful here. Place a medium saucepan over high heat and add the chickpeas, beans, and baking soda. Cook for about 3 minutes, stirring constantly. Add the water and bring to a boil. Cook, skimming off any foam and any skins that float to the surface. The legumes will need to cook between 20 and 40 minutes. Once done, they should be very tender, breaking up easily when pressed between your thumb and finger, almost but not quite mushy. Drain the chickpeas & beans. Place them in a food processor and process until you get a stiff paste. Then, with the machine still running, add the tahini paste, lemon juice, garlic, and 1 1/2 teaspoons salt. Finally, slowly drizzle in the iced water and allow it to mix for about 5 minutes, until you get a very smooth and creamy paste. Transfer the hummus to a bowl, cover the surface with plastic wrap, and let it rest for at least 30 minutes. If not using straightaway, refrigerate until needed. Make sure to take it out of the fridge at least 30 minutes before serving. Drizzle with olive oil, sprinkle with paprika. ‹ PreviousThen what is a sprint?